The "Really delete [title of note]?" 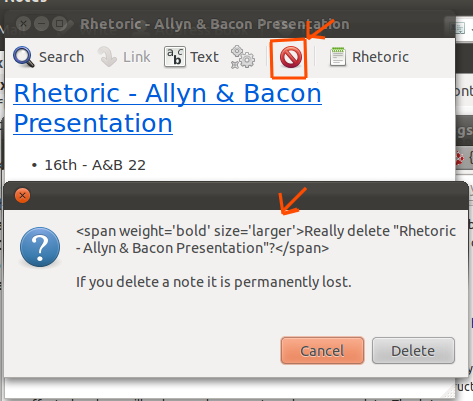 warning dialog incorrectly shows the Pango markup instead of parsing it and formatting the text as bold when the title of note contains the "&" symbol. 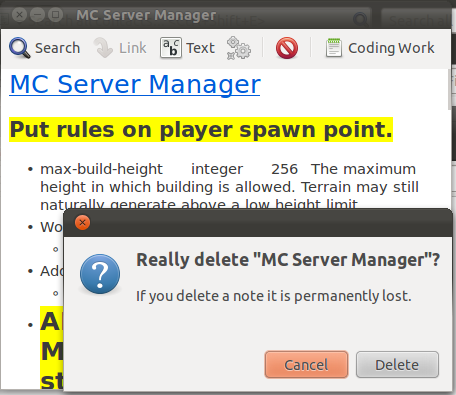 * The main dialog text is bold and larger, as seen whenever deleting a note without the "&" in the title. See the attached screenshots for the incorrect and correct formatting. I can verify this bug on the same version of Ubuntu and Tomboy that you have. As an update, though it's low importance, I can confirm the dialog text still breaks on Ubuntu 13.10 with Tomboy 1.15.2.